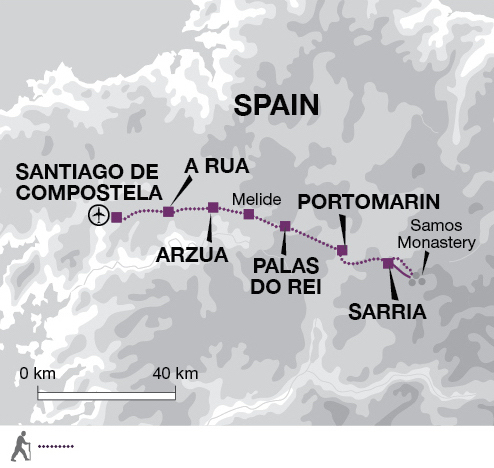 Walk self-guided along this iconic pilgrimage route to Santiago de Compostela - the reputed final resting place of Saint James. Starting in Sarria, hike through the Galician hills and rural countryside along the Camino Frances, following the waymarker scallop shell signs. After making your own way to Sarria by public transport or by private transfer, you'll have the rest of the day free to relax and perhaps take a stroll through the town. After breakfast, a taxi will take you to Samos for the start of today's walk at the Monastery. Although founded in the 6th century, Samos Monastery found its wealth and popularity when it became part of the Benedictine community in the 10th century. It has welcomed pilgrims from the beginning and makes a fitting starting point of this tour along the Camino. From here you walk back to Sarria along dirt roads through small hamlets and woodlands. Today's walk is 15 kilometres long over mostly flat terrain and should take around 4.5 hours. Setting off from Sarria today, your walk along the Camino is mainly along small, tree lined country roads and footpaths. Passing through many hamlets along the way, you'll have plenty of opportunities to stop for refreshments and rests, until you reach Portomarin, which is your destination for today and where you'll spend the night. Today's walk is 23 kilometres long with and should take around 7 hours. The route today takes you from Portomarin to Palas de Rei and is mainly easy going through rolling countryside. There is a short, steep downhill section as you leave Portomarin along the main street, and a gentle uphill section near Monte San Antonio. When you eventually reach Palas de Rei you will be met and taken to your hotel. Today's walk is 26 kilometres long and should take around 7.5 hours. You'll be transferred back to Palas de Rei for the start of one of the longest but technically very easy sections of the route, with no long steep ascents or descents. Pilgrims consider this section the start of the countdown to Santiago de Compostela, shortly after Coto you'll begin to see stones appearing at the side of the path with the distance to Santiago marked. Much of the day is shaded and shortly after Melide you will walk through an oak and eucalyptus forest. Todays walk is 29 kilometres long and should take around 7.5 hours. A lot of today's section of the Camino runs along side the main road en-route to A Rua, but after finishing the relatively short distance you'll have just one more day of walking left before you reach the final destination of Santiago de Compostela. Today's walk is 18 kilometres long and should take around 6 hours. The last section of your pilgrimage brings you back to modern life as you pass the regional airport, cross the highway, railway track and ring-road around Santiago. Nevertheless, it's still easy to imagine the sheer joy ancient pilgrims felt when they caught a first glimpse of Santiago and the spires off in the distance. Historically, those making the pilgrimage made one last stop at the spring in Lavacolla to wash their face and feet before presenting themselves to the Saint at the Cathedral on Plaza Obradoiro. 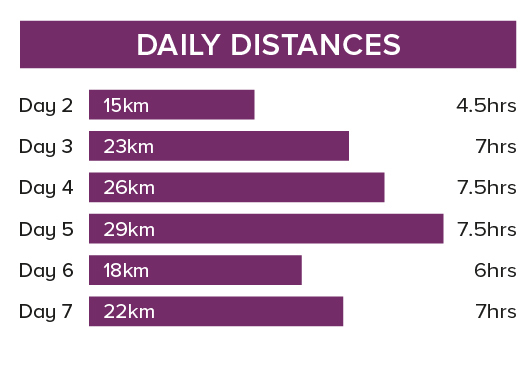 TodaysToday's walk is 22 kilometres long and should take around 7 hours. Today is left free for you to relax after completing your journey and to explore Santiago further. Today you'll travel back to Santiago Airport by public transport where your trip ends. Walking or trail boots with good ankle support are essential, plus comfortable trainersandals for relaxing. Bring one main piece of baggage as per your airline luggage allowance, maximum 20 kg per person. Remember you may need to carry your luggage at times so don't overload yourself. Luggage transfers between hotels are normally arranged by the hoteliers. Mark your bags clearly and leave them at the place and time arranged with them. When travelling on public transport / a ferry you should always take your luggage with you. Bring a water bottle, torch, sunhat, sunscreen and sunglasses. A trekking pole is recommended for the steep descents. Michelin Zoom Map 160 - Camino de Santiago (scale 1:130.000 / 1:200.000). to Sarria. This service is operated by Monbus and departure is at 15.00hrs, arriving around 17.50hrs. There is a later bus at 20.30 arriving at 23.15. The price is 13 euros p.p. www.monbus.es. (Remember that you will first have to get the airport shuttle to the central bus station in the city (with www.empresafreire.com, every 30 min). There is a shuttle bus (line 4051 Puerta Real - Aeropuerto) that leaves daily from the airport every 30 mins between 7.15 and 21.45hrs. The cost is 1.50€ per person/ way. On Saturdays there is a service every hour from 8.00 to 22.00hrs. On Sundays and holidays there is a bus every hour from 9.00 to 22.00 hrs. Get off at "Alfonso Molina E. A (Estación de Autobuses)" in A Coruña. From the bus station in A Coruña ("Alfonso Molina E.A" stop) take a direct bus to Lugo. The bus company is "Arriva" and you can check the information at http://www.arriva.es/index.php?option=com_buscalineas&view=resultados&Itemid=86&pOrigen=257&pDestino=339&fecha=29/10/2015. The approx. cost is 11.25€ and the length of the journey varies from 1hrs 15 mins to 2 hrs depending on the bus chosen. Take the shuttle bus to "Alfonso Molina E.A", located near the train station . There is a direct train a few times a day that takes around 2.5hrs to Sarria and the approx. cost is 13.60€. For more information, prices and time schedules, check: www.renfe.es The train station in Sarria is located 1.5km from the hotel, so the best option is to take a taxi to the hotel. Buses depart from Santiago city centre to Santiago Airport (SCQ), every 30min from 06.20 to 23.50hrs. Walks on 6 days for between 4 to 7 hours.